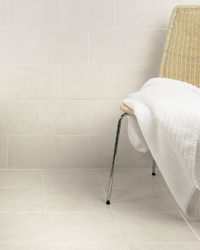 H & R Johnson manufacture an extensive line of wall and floor tiles for commercial and residential installations. All products conform to all recognized quality standards. To view the Commercial Product Range, please click here. To view the Residential Product Range, please click here. All of the Johnson product range is available for sale to our stocking distributors throughout the USA and Canada. In territories where there is no available distributor, special orders can be arranged to tile contractors, homeowners and other interested parties. To support our distributors in '09, three new and distinct ranges will be stocked in the H & R Johnson warehouse in New Jersey, supplementing existing lines. Each are supported by literature and a point of sale display to enable customers to make selections. Six series of matching walls and floors in the 30x20cm (12x8") and 30x30cm (12x12") sizes. Trim and coordinating borders complete the package. Styles include Marble, Sand Stone and Carrara. To learn more, click here. Natural marble, travertine and onyx have adorned interiors for well over 2000 years. And now we have captured the pure essence of their beauty to create our modern Naturals Collection. Previously known as our Elegance collection, Naturals is a stunning range - featuring the 4x12" (shown) - of the highest quality ceramic tiles designed to perfectly replicate the look and feel of natural marble, travertine and onyx – but without the high cost and maintenance. To learn more, click here. Johnson Tiles Vivid collection captures the vogue for vibrant statement colors to add impact and contrast to interiors. There are ten colors to choose from which have been specifically color matched to complement each other: Clay, Orange, Red, Lime, Blue, Teal, Purple, Gray, White and Black. 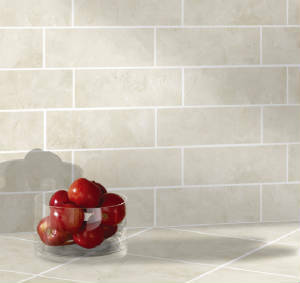 Each tile has a subtle pinstripe design to add just a hint of detail. If you want character, life or even a sense of adventure, our Vivid collection offers a world of opportunities. For more information about our Vivid collection, please click here. Tones' subtle hues of soft greys, cream and mocha are perfect for creating neutral calming interiors. The collection is specificaly designed to be used throughout the home and includes 3-D textured tiles: Linear, Wave and Nano, to add visual depth and interest to walls . Or to create impact and effect use the striking Tones Forest decorative with its soft palette of cream and coffee which complement the neutral shades of the collection. To view more information about our Tones collection, please click here. Creating a sense of calm serenity, white tiles are perfect for adding sophistication and elegance to busy spaces. Reflecting light, they can also make a room feel larger. Clean, cool and refreshingly simple. Our Whites collection offers subtle variations in shades and textures, making it easy to blend tiles with the rest of your color scheme. The new large, module Whites collection is immediately available in 4x12", 6x16", 12x12", 12x16" and 12x24" in both matte and gloss in the United States. pool edging and pool deck to changing areas and pool hall & changing room walls, all antislip floor tiles are backed up by independent slip testing to the HSE recognised Pendulum TRL for wet barefoot areas to give total peace of mind and reassurance of specification.